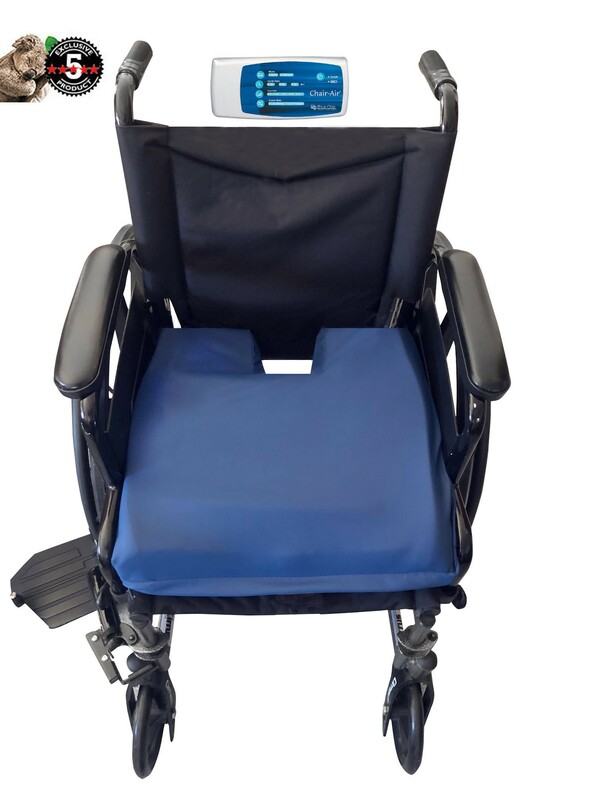 Alternating Pressure Coccyx Cushion for wheelchairs for the prevention and treatment of stages I-IV tailbone sores. 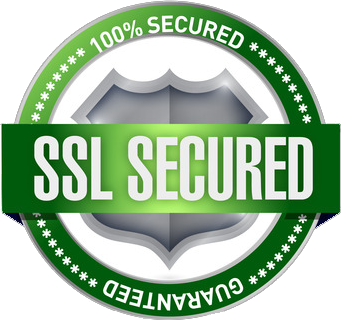 Developed by Purely Comfort LLC. Only cushion of its kind. Size: 16", 17" 18" 20" x 16" or 18" x 3"
Cover: Low shear, zippered stretch knit, anti-microbial. -- Please Select --16" x 16" 17" x 17" 18" x 16" 20" x 18"
Developed by Purely Comfort LLC, our Alternating Pressure Tailbone (Coccyx) Cushion was created specifically for the prevention and treatment of stages I-IV bed sores on the coccyx and sacral areas. Sores on the tailbone otherwise known as the Coccyx are particularly difficult to treat and reoccur quite frequently. For those who are less mobile or confined to a wheelchair, recurring coccyx or sacral wounds are a significant health concern. This is in part due to how thin the skin is over the tailbone, the inability to reposition and improper seating positions. The inability to reposition does not allow for pressure relief and makes the person prone to shearing injuries and frequent recurrence. Because of this, tailbone sores often advance quickly to late stage wounds. Prevention is key, treatment is essential. The coccyx is the remnant of a human tail and while it does not serve the purpose of swatting flies, balance or hanging from trees, the coccyx/tailbone is an anchor point for essential tendons, ligaments and muscles. The tailbone also serves to stabilize the body while in a sitting position. 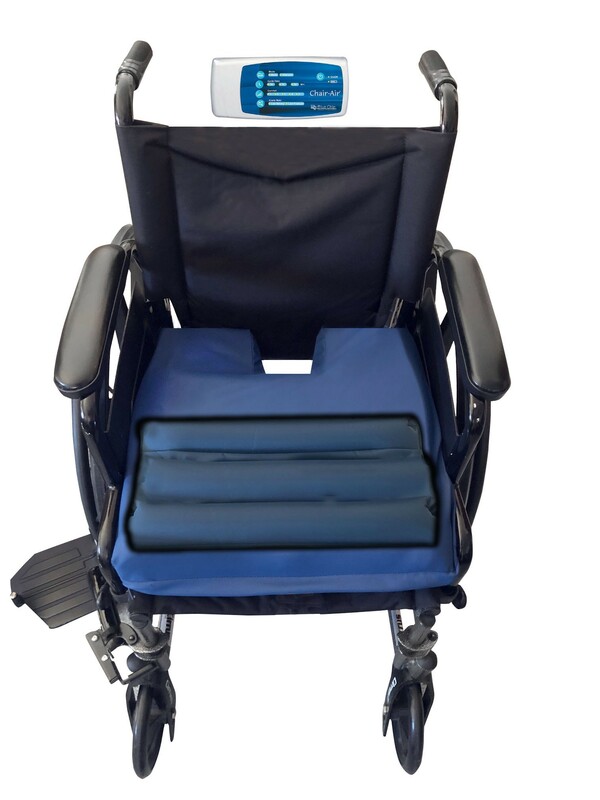 Alternating pressure coccyx wheelchair cushion features a unique pressure relief zone in the coccyx area as well as four air bladders that alternate to provide superior comfort & pressure redistribution for the prevention and treatment of stages I-IV pressure ulcers. The cushion is covered in Vyvex-IV, a durable multi-stretch urethane material that is anti-microbial anti-bacterial, low shear and low friction. 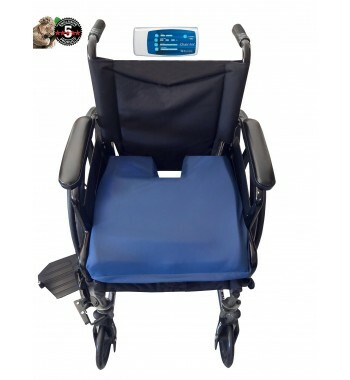 There is a non-skid bottom and adjustable straps to secure the cushion to the wheelchair. The cover is very soft to the touch yet extremely durable, stain resistant and fluid proof. The cover is easy to clean with a simple 8% bleach/water solution. The portable AC/DC Pump allows your patient to be totally mobile. 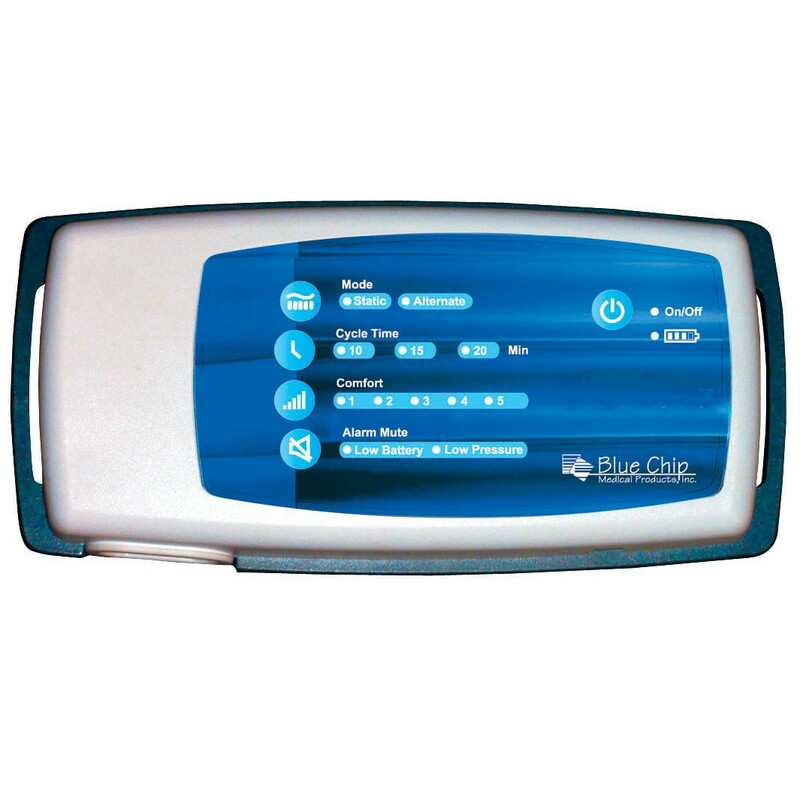 The cushion can be plugged in to any standard outlet or operated on its internal battery The rechargeable battery backup keeps this system working up to 6 hours per charge, based on the patient’s weight. Our alternating pressure coccyx cushion is available in 16", 17", 18" & 20" widths and 16", 17", 18" depths. The cushion is 3.25" thick and supports weights up to 250 lbs.. Custom sizes are available upon request. Custom Cushions are not returnable. The Alternating Pressure Coccyx Cushion is another Purely Comfort LLC innovation and sold exclusively by Comforts Best. Manufactured entirely in the US. It has been my pleasure to meet and work with Jeff Adise, President of Comforts Best. I have Parkinson’s with a COMT gene variant that dictates if I have Parkinson’s I will have pain. Jeff Adise has helped diminish a lot of the pain. I have a coccyx injury from a 1986 boating accident. There was no alternating pressure cushion for the coccyx until Jeff developed one. Since I don’t move, I end up pain in the sit down bones (ischael tuberosity). The cushion has stopped most of this pain as well as relieved the coccyx pain at the same time! This has given me a comfortable alternative to lying down. Comforts Best is a company that has behind it a President with a heart to help people. Excellent customer service! Your Comfort is our Mission. Comforts Best puts the health and well-being of our customers before profit to provide you the most durable medical equipment at a fraction of the cost of medical dealers. Wherever you go and whatever you do there is a Comforts Best product to help improve your "koalaty" of life. We are dedicated to serving our customers with innovation and integrity by offering innovative products of the highest quality that meet or exceed expectation for performance and value. © 2019 ComfortsBest. All Rights Reserved.